This current flashes to the ground from the negative charged cells in the thunder cloud. There is less chances of strokes from positive charge to the ground. The rising time of the negative charged flash is in the order of 10 µs and that of decay time less than 100 µs. The multi stroke may be 10 strokes together. The estimated potential of the charged flash is approximately. The cloud potential may be 100 MV. As the current is discharged to the resistance path of the earth electrode, it raises the potential of the protective system with respect to the earth. This high potential gradient earth electrode is dangerous to the human beings. If the lighting current is discharged through internal installation of the whole electrical system resulting flashover may be possible to the whole structure. As the magnitude of the current is high for short duration resulting the thermal effect on the protection system cannot be neglected. Similarly when the lighting stroke discharged to single conductor / parallel conductor, the effect of mechanical stress on the bends and fittings are also considered. The power of return stroke of 10MW / meter may damage to the fabric of the building. The function of the lightning conductor is to discharge lightning stroke to the earth therefore protect the vulnerable part of the structure of the building. The range of attraction of lighting conductor to lightning stroke is not constant but it depends upon vertical and horizontal configuration of the conductor. The structure which consists of highly explosive factories, stores, large number of peoples congregates, essential public service related, historic places or cultural importance requires lightning protection. 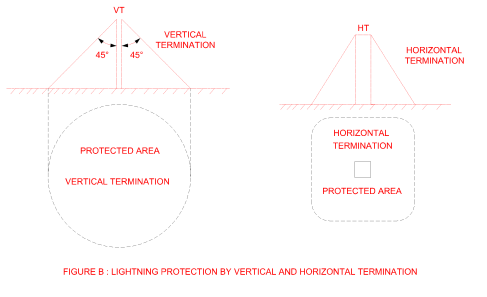 The effective lightning collection area of the structure for a building depends upon type, size and shape of the building. It is calculated at the edge of the corner of the building. If a rectangular building having length L, height H and width W meter, the length of the collecting area becomes ( L + 2H ) and width is ( W + 2H ). The lightning protection angle depends upon lightning stroke and its calculation is not accurate. 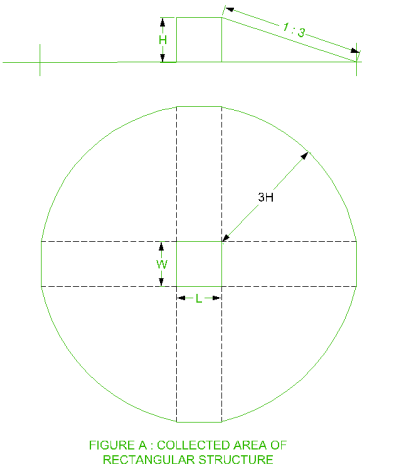 As the protection angle decreases, the protection by the lightning conductor increases. The protection angle for any simple structure having vertical or horizontal termination network is taken as 450. Howto Find out Number of Sub Circuits in Electrical Load?